is designed to work mechanically, designed to alter movement patterns while absorbing load and re-injecting that energy back into movement, all without limiting range of motion. Kinesiology tapes are designed to work neurophysiologically, attempting to alter pain perception, muscle activity or circulation via contact with and lifting of the skin. Brand new packaging system that removes all single use plastics from our packaging and allows the tape to maintain good edges while transporting. Stackable, and comes with a dispenser system. All Packaging is recycled or recycleable. 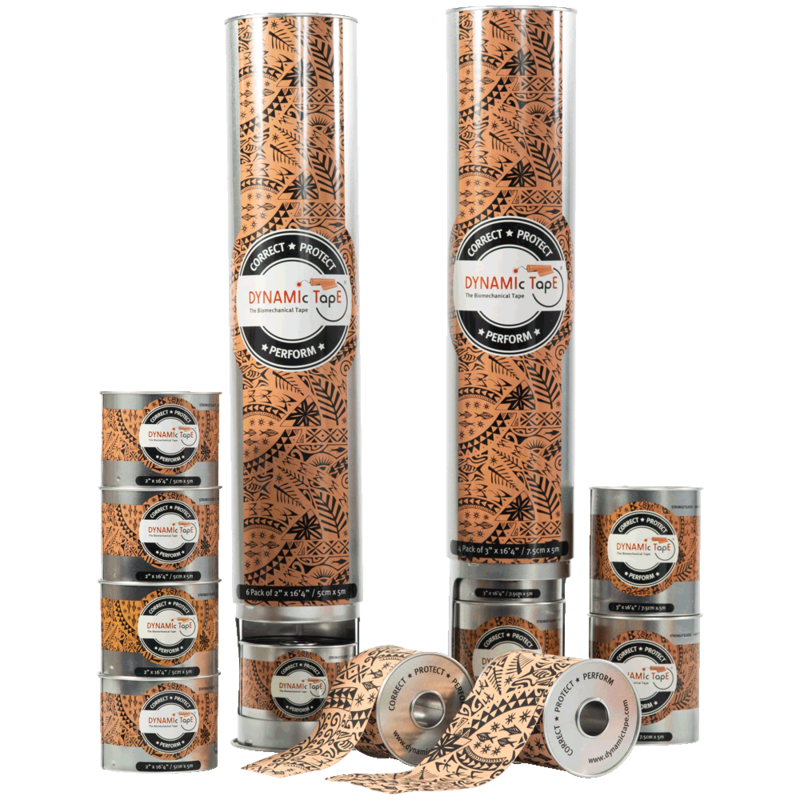 The original Dynamic Tape with black tattoo or beige tattoo on a beige background fabric with high elastic stretch, strong resistance and recoil is also recyclable. Why is it called a Biomechanical Tape? Biomechanics is defined as “the study of the mechanical laws relating to the movement or structure of living organisms.” Dynamic Tape has been designed to allow an external force to act upon the levers of the body. If a genuine force can be applied (and this requires correct application), the forces that the body must generate are modified accordingly. For example, if Dynamic Tape can provide a decelerating force to someone’s follow through in their tennis serve, the load on the muscles, capsule and ligaments of the body normally charged with decelerating the arm is reduced by the same amount of force that the tape contributes. 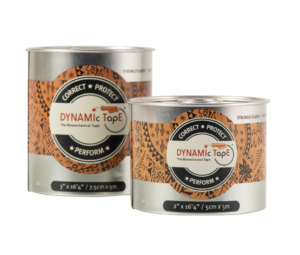 Dynamic Tape has many clinical applications. Load is a key driver of pathology such as tendinopathy. Loading is necessary for recovery but often normal activities are beyond the capacity of the tendon. Dynamic Taping can be used to reduce loading to allow some functional stress to be applied without overloading the already sensitised tendon. This can allow capacity to be increased through controlled loading. Gravity acting on the body may be a load too great in cases of weakness e.g. post total knee replacement or a foot drop. In the first case, patients often splint their knee and walk with a stiff gait on a semiflexed knee for fear of it collapsing. 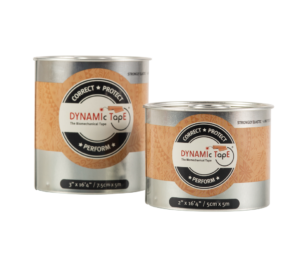 Dynamic Tape can help resist them collapsing into flexion and improve their inner range knee control allowing them to walk with a more normal gait pattern, reducing compensation, fear and often pain*. This allows them to again load and strengthen the quadriceps appropriately. By resisting the foot dropping under its own weight in a neurological patient, immediate improvements in gait and function can be obtained with preliminary research showing improvements in 3D kinematics and functional outcome measures. Immediate functional improvement can be obtained by taping mechanically using known principles of positioning to modify tone. A technique to address both wrist and finger extension. This will not speed up the recovery but has many benefits for the immediate ability to grasp objects. If a force can be introduced, kinetics can be affected and this may be the aim in something like a muscle strain. If kinetics can be modified, kinematics may also be influenced as in the case of the foot drop and this results in an immediate functional improvement. Modifying kinematics can in turn further modify kinetics, force transfer and loading by a change in lever arms or length-tension relationships. Firm compression created by the strong recoil of Dynamic Tape can increase the coefficient of friction at the joint surfaces and augment stability via this ‘force closure’ mechanism. This may be useful in joint and ligament applications. In addition to directly improving articular stability, External Pelvic Compression has been shown to reverse motor control deficits in pelvic girdle pain subjects for example. Emerging research is demonstrating that a force can be contributed resulting in these changes. Bittencourt et al, 2017 showed a reduction in high frontal plane knee projection angle in elite female volleyballers during a squatting task. Nicole Robinson recently won the Best Young Investigator Award from Sports Medicine Australia ACT branch for her work demonstrating changes in magnitude and velocity of hip adduction and internal rotation in a Greater Trochanteric Pain Syndrome cohort but only when taped in the shortened position suggesting that the effect is largely mechanical, not neurophysiological or due to expectation as the kinematic changes are not present when taping exactly the same way but with the body part in the lengthened position (no bungy effect). Beige with Beige Tattoo – has strong elastic resitance and recoil suitable for biomechanical taping. Of course, it can also be laminated into a PowerBan to create a very strong resistance and recoil when required. Beige with Black Tattoo – generally exibits stronger resitance and recoil properties. It has very good energy storage and release capacity which is enhanced as a PowerBand. This makes it ideal for musculotendinous applications like muscle tears and tendinopathies and also for large multi-joint applications. Black with Grey Tattoo – has a higher elastic modulus so hits a much higher resistance sooner in its range(less stretch). This makes it ideal for applications where there is very little movement but high resistance is required. Pain is complex and is not well correlated with tissue damage. Pain can persist long after structural damage is thought to have repaired. Pain can be present as a warning sign before any damage has occurred. Beliefs, expectations, past experiences, social and environmental factors all influence the pain experience. That does not mean however that we should forget about the tissues or structure entirely. As clinicians we need to determine if there is structural damage, is there nociception or inflammatory influences, is there peripheral sensitisation and primary hyperalgesia? Perhaps there is no ongoing damage, nociception or inflammation but central sensitisation is continuing to wind up the pain perhaps from non nociceptive peripheral drivers (possibly coming from maladaptive movement patterns). Do we need to have a more comprehensive preparatory phase and education? Can we use Dynamic Tape to normalise movement and to challenge faulty beliefs about pain, movement and damage? In many cases however the pain present is still load dependent. The more we load it, the more it hurts. Directly modifying load by creating some of the force externally or indirectly modifying it by changing movement patterns, reducing compression etc. may reduce pain and some research on the hip is showing preliminary support for this. There could be several possible mechanisms for how Dynamic Taping can influence pain. sensory signalling from the periphery is also heavily involved in the pain experience. A reduction in load and therefore firing of sensitised structures (not necessarily damaged) will also affect the pain experience. Non-opioid mediated analgesia – a sympathoexcitatory effect is often observed and may be suggestive of a non-opioid mediated analgesia similar to that seen with some manual therapy techniques (e.g. as demonstrated in studies on Mulligan lateral glide of the elbow or Elvey lateral glide of the cervical spine with subjects with tennis elbow). Normal afferent input may have a modulating effect on the pain experience. Due to its constant but variable stimulation to the skin, approximation of the joints and varying stretch on the muscle (occurs as the tape is placed on the body with the muscle in a short position and with tension on the tape such that when the muscle is lengthened, the tape tightens significantly, compressing the tissues) a lot of mechanical stimulation occurs. Beliefs, expectations, past experience and many other factors have a profound effect on the pain experience. A reduction in the perception of threat may result in a lessening of the pain experience. Dynamic Taping may be used to challenge faulty beliefs about movement and tissue damage or pain. Exercise also has a modulating effect on pain. Permitting exercise through functional improvement e.g. improving knee control or improving gait in someone with foot drop, could allow for pain relief via the various mechanisms associated with exercise. Determining what ‘deficits’ exist and their relationship to the presenting condition is critical. This following example illustrates this nicely. The subject has quadriceps weakness due to L3-4 nerve root compression. He demonstrates increased frontal plane motion (i.e. hip adduction) and velocity during load acceptance phase when landing from a hop. He also has increased knee flexion. In other words, he has insufficient strength to control the load and collapses into knee flexion and wobbles about at the hip. This was measured using DorsaVi. Side to side comparison showing increased tibial inclination and magnitude and velocity of frontal plane motion on the affected side(left). Interestingly but not surprising when given due consideration, when the hip is taped to resist adduction and internal rotation, the velocity of the motion is reduced maximally however the magnitude remains unchanged and the tibial inclination (indicative of knee flexion) remains the same. In other words, he is still not able to attenuate the force and control the knee flexion moment at the knee so must still bend the knee and move at the hip but the tape is resisting hip motion so the velocity is reduced. The key point being that our technique must be based on sound clinical reasoning and a thorough examination. Determining the underlying cause for what is observed is critical. Simply, observing increased frontal plane motion and therefore taping the hip does not address the reason why this motion is occurring and that is due to a quads deficit. If the quadriceps were fine and the glutei were weak, taping the hip would be appropriate. Ultimately, building strength is required however Dynamic Taping may be useful to improve the quality of exercise and to reduce risk of re-injury during transition periods e.g. if this presentation was following an ACL repair the tape may be useful as the athlete transitions through various stages to higher risk activities e.g. jogging, jumping/landing/changing direction etc. as it is often necessary to perform the tasks in a controlled way in order to build capacity such that they can control those movements. The importance of the high, 4-way stretch of the Dynamic Tape was demonstrated with this evaluation. In all three conditions (and there were multiple repetitions of each – average shown) the athlete’s ability to flex the knee in preparation for the jump was not impaired by taping the knee into an extension direction. Read more on our RESEARCH page. As just eluded to, often it is about function and pain might not even be present. Our aim might be to improve gait and reduce the likelihood of falling in a person with foot drop. Preliminary research has demonstrated improvements in kinematics and functional outcome measures associated with gait. Changes in movement might be desirable to improve a golf swing or posture in a dancer or equestrian athlete. Positioning is also very important for optimizing tissue repair. Our technique might aim to maintain DIP extension on a mallet finger. Positioning also influences tone. Techniques might look to break a dominant pattern by positioning in various ways e.g. taking the thumb out of the palm or gaining some wrist extension. Dynamic Tape is not a medication. It is not a treatment in and of itself but is used as part of an holistic approach in empowering the athlete or patient to drive their own recovery. If applied incorrectly, no force is contributed to the system and no mechanical change to kinetics or kinematics results. Attempting to change a movement e.g. hip adduction/internal rotation when that movement is normal or not a contributing factor will not result in any change. Some diagnoses and applications are more straightforward than others e.g. a quadriceps strain however we recommend that clinicians attend a Dynamic Taping workshop if possible and that a suitably qualified clinician is consulted prior to use. *The information provided above is drawn from a large body of background research and attempts to show how that is integrated into Dynamic Taping practice. Emerging research specifically relating to Dynamic Tape can be found on our RESEARCH page. Results are heavily dependent on the clinician. Clinical trials have not been conducted to validate the efficacy of Dynamic Taping for all conditions. Dynamic Tape has been thoroughly test and reccomended by FICS.